The Savvy Stamper: Cupcakes and Presents Galore! Good evening! I was able to get some pretty good crafty time in yesterday with a friend, and this is one of the products of my time. It was great - kids even played well so we could craft! In going through my card kit stash, I found this little guy and couldn't wait to color him! I think he's just adorable, and I adore this cupcake paper too. Keeping the layout pretty simple, this will work well for a birthday boy card. Most of the supplies are from a kit, so I'm not sure who they are by, but I did add SU cardstock in Green Galore and Brilliant Blue. The image is colored with Copics. 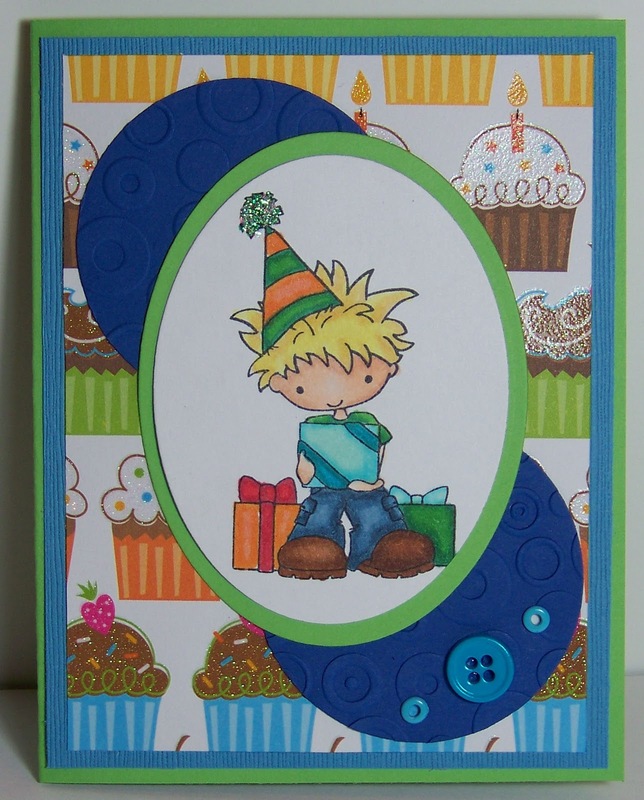 Other supplies are Star Dust Stickles, Cuttlebug embossing folder, circle and oval nesties. Super, super cute!! LOVE this image too and the colors are great for a boy b-day card. Love your layout. Super adorable card! I love the color scheme and the cupcake DP! Such a great card fir a boy. Awww. love that image - and your DP is super yummy too!